← Is Britain Dangerously Diverse? As the gruesome scenes from Brussels emerged on Tuesday, they bore an uncanny resonance to feelings I brought home from my recent trip to Pakistan. Visiting the country I grew up in for the first time following the dreadful Peshawar school attack in December 2014, I felt that the school children massacre had reshaped the contours of terror that have sketched an already fragmented and pillaged landscape. As family members who were recently the targets of a terrorist assault on their home and business premises revealed, more than ever today, living with the extremist scourge had become concomitant with living in Pakistan. And throughout my 15-day sojourn in the country, this feeling came home with a growing sense of profundity and poignancy. The tree-lined boulevards, the bustling market places, packed restaurants and chic retail outlets sit juxtaposed with small children begging barefooted on the streets, random kidnappings from otherwise affluent districts and vile sermons spilling out of mosques in major cities. It has become a country of lit festivals and hardline clerics, of corruption and philanthropy, of major fashion high streets and full-veiled women. It has become a country of confounding contrasts. The hotel that just offered you a surreally peaceful spring afternoon savouring the delights of a lush meal, may well be a hotel that has been privy to a major bombing, sitting like a fort at the heart of the city. The pictures that came out of Paris last year and Brussels a few days ago seem to herald the beginnings of such duality: places frequented in the everyday-ings of life being targeted and brought down. A frightening prospect being widely shared across mainstream media that this may well signal the “new norm” in Europe. 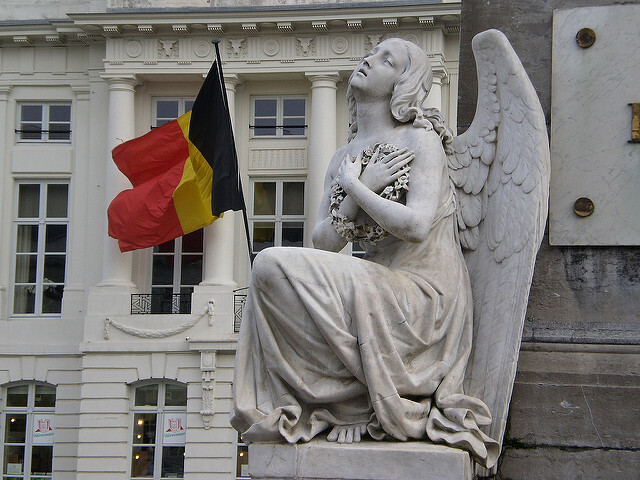 In addition to the outpouring of grief and messages of condolences from across the globe, the reactions to the atrocities in Brussels were also not uncommon. Pundits on both sides of the political spectrum took to social media either offering apologetic defences of Islam or lambasting the Muslim faith as being inherently and incurably violent. While such standpoints may well be either emotive or knee-jerk, they cloud the ability to wade through what has become an increasingly complicated geopolitical and to a lesser degree, ideological situation. Amid the plethora of contesting viewpoints attributing blame to state and non-state actors, a common assumption appears to linger – that Islam is at the root of the rising tide of extremism. However, to suggest that scripture alone inspires Islamist militants would be to submit to an overly simplistic conclusion of a dreadfully thorny and complex predicament. The Quranic passages ordaining the killing of infidels (9:5) (frequently referred to as the verse of the sword) and smiting the necks of disbelievers (47:5) are often cited as the foundation whereupon extremist ideology has been constructed. The merits of such claims can be refuted by examining just one verse from the Quran – Chapter 3, Verse 8 details how to interpret the Quran, enumerating that it contains two kinds of verses: context-independent verses that form the “basis of the Book” and are enduring in their application, and context-dependent verses that were revealed for specific situations. The Quran unequivocally condemns cherry-picked textual fidelity designed to further individual ends, saying that, “…those in whose hearts is perversity pursue such thereof as are susceptible of different interpretations, seeking discord and seeking wrong interpretation of it.” Moreover, permission to fight has only been granted to a party who is being wronged in self defense (22:40) (Muslims are never granted permission to attack) and in perhaps the greatest testament to preserving multifaith identities permission to fight was granted to protect not just mosques but equally churches, synagogues and temples (22:41). To this extent, the Quran lays down rules of war in as much as the Geneva Conventions regulate warfare, but to claim that international law is inherently violent on that basis would be to advance a hollow and ludicrous argument, its insincerity and fractured purpose overtly self-evident. It begs the question then whether extremists are really relying on this hand-picked allegiance to a few particular verses of the Quran that are clearly context-dependent and were revealed and applied only at a time when war had been openly declared on Muslims? Is this truly where they find their sole inspiration? In a witty and insightful talk at Saint Anthony’s College Oxford on the evening of the Paris attacks, Karen Armstrong made the case for motivations of extremists to be largely political. She spoke of how two young Britons going to fight in Syria had ordered Quran for dummies and Islam for dummies online, and how a hostage released by ISIS last year revealed that when the call to prayer sounded, none of his captives got up to pray – and when asked for a copy of the Quran, no one had one handy. Studying the history of the rise of various extremists seems to cement these views. The Afghan and Pakistan Taliban for example were borne directly out of the Soviet War in Afghanistan, employed by the US as freedom fighters at the time. Hilary Clinton has admitted on record that you harvest what you sow. The history of the creation of ISIS has also been traced to the invasion of Iraq in 2003. It appears that the big questions of where ISIS came from in the first place and who is funding them are being willfully ignored. There appears to be a lack of a genuine and honest commitment to getting to the root cause of the extremist paradigm and work towards plausible solutions. In an article in the Independent last year, Tom Brooks-Pollock highlighted how the major financiers of ISIS were oil-rich nations like Saudi Arabia and Kuwait. The paradox was profound then when news reports emerged of Britain’s secret vote trading deal with the Saudis, allowing both countries to be elevated to the UN Human Rights Council. For Saudi Arabia to have a UK-backed seat at one of UN’s most influential human rights bodies is not only an oxymoron from the perspective of the Kingdom being a major sponsor of ISIS but also given its alarming human rights record – just this January carrying out 47 executions. Without a genuine and firm commitment towards tackling the causes of the extremist scourge, re-thinking our alliances with despotic regimes as trading partners and showing measured, egalitarian responses to incidents of extremism, the pandemic of the terrorist threat will only intensify making the surreal Pakistan experience ripple even more strongly in Europe. The seemingly just world orders have been traditionally unjust in their pursuit of justice, paradoxically pursuing a path of “unjust justice” with only their vested interests in mind, surpassing any measure of r heresy. We castigate Muslim-majority countries’ human rights record on the one hand yet make clandestine deals with them on the other ensuring them a place on a major international human rights body in order to secure lucrative trade flows. Today if we are to defeat the menace of terrorism, the universal grundnorm must be reformed to echo an unbiased morality rooted in humanity. With this moral compass in mind, the pursuit of justice must be revisited – in the lack whereof not only the plague of extremism will be further fuelled but also all secular ideals will be progressively turned on their heads. Ayesha Malik is a Contributing Editor of “islawmix” – a project incubated at the Berkman Center for Internet and Society at Harvard University and aimed at bringing clarity to Islamic law in the news. She is also the Deputy Editor of the Law and Human Rights Section of the Review of Religions Magazine, a journal focusing on comparative religion since 1902. Her writings have appeared in the Oxford Human Rights Hub Blog, the Harvard Human Rights Journal Online and the Cambridge Review of International Affairs Blog. She is a graduate of Harvard Law School. Spot on! Well constructed argument, I wish it were also published in the mainstream media. Well written and beautiful blog!